Fourth Squad detectives are investigating an Attempted Robbery that occurred on Tuesday, December 23, 2014 at 12:29 pm in Hewlett. Hewlett, NY - December 24th, 2014 - Fourth Squad detectives are investigating an Attempted Robbery that occurred on Tuesday, December 23, 2014 at 12:29 pm in Hewlett. According to detectives, two male black subjects, who were carrying cardboard boxes, walked up to the front door of a Henrietta Place residence and rang the doorbell. The homeowner observed the two subjects who were wearing dark brown jackets similar to that of a UPS style uniform. The homeowner who became suspicious of the subjects told them to leave the packages on the stoop. The subjects told him that the delivery required a signature and would not be able to leave the packages without it. Upon unlocking the door, the subjects attempted to push the door open but were unsuccessful. The subjects, who then fled the property, were last scene entering a dark colored 4 door auto which was parked in front of the Franklin Elementary School. The vehicle, that was previously occupied by two other unknown subjects, then fled the scene heading east on Henrietta Place. The uninjured victim described both subjects as being approximately 5’10’ tall with thin builds. Both were wearing brown jackets with gray hoodies underneath. One subject had a snake decal on the left side. Both had dark colored jogging pants and were armed with handguns which were displayed as they ran to the waiting car. Detective request anyone with information regarding this incident to call Crime Stoppers at 1-800-244-TIPS. All callers will remain anonymous. 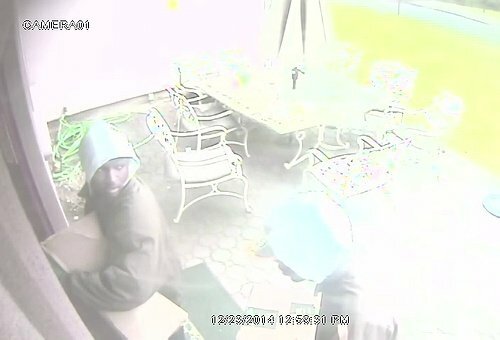 Subject: LongIsland.com - Your Name sent you Article details of "Duo Wanted for Impresonating UPS, Attempting to Rob Hewlett Home"